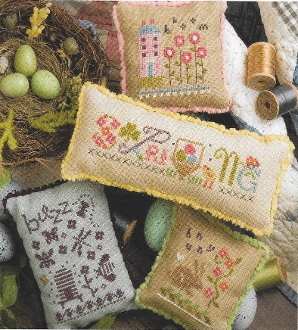 This chart is packed with four lovely Spring designs. Pattern includes Embellishments! Design sizes: Spring 5.75" x 1.5", Bloom 2.5" x 2.5", Bunny 2" x 2.5" and Buzz 2.5" x 4". Models stitched 2 over 2 on 32 count and 30 count Linen (sold separately, see items 31-100 and 31-101). Instructions given using Weeks Dye Works threads with conversions given for DMC embroidery threads (not included). Chart includes two tiny buttons and one dragonfly charm.